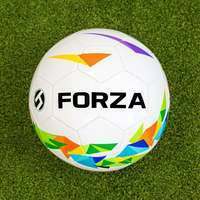 16ft x 7ft FORZA Alu60 Football Goal for 9-a-side matches and senior training sessions. Weatherproof 60mm aluminium framework with foldaway side frames. Single or pair. Need another size? 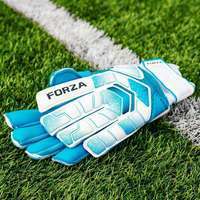 View our full range of FORZA Alu60 football goals here. 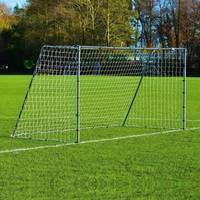 With dimensions of 16ft x 7ft, this premium quality football goal will leave a lasting impression throughout the ranks of your club. 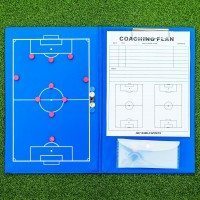 Suitable for 9 v 9 matches undertaken by under 13's as well as senior coaching sessions, this professional football goal is perfectly capable of pulling double duty. 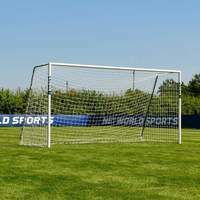 No corners have been cut in the professional manufacturing of the aluminium football goal posts, providing premier levels of durability while maintaining a delicate, light touch for portability. The 60mm reinforced aluminium frame can be carried by two people, with foldaway side frames for convenience. 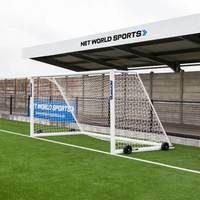 Having been powder coated in a sleek and classy white, the goal posts provide phenomenal protection against rust and corrosion caused by the weather when left outside. Similarly, the included 3mm HDPE white goal net won't become damaged or frayed no matter the amount of pressure it's put under. 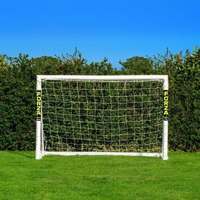 At 16 x 7, this professional quality football goal is the perfect size for junior 9-a-side matchday. 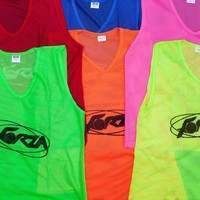 This form of football, typically played by under 13’s, prepares youngsters for the real thing, and as such requires specific equipment. Harnessing world-class manufacturing, resulting in a game-changing goal, this the best aluminium 9-a-side football goal on the market. 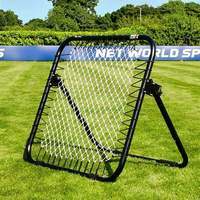 Loaded with versatility, it is equally suitable for use as a smaller sized target football goal used by coaches during senior training sessions. 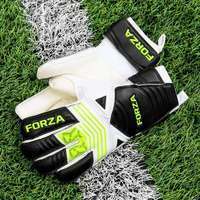 Designed to bring professionalism to junior 9-a-side matches and coaching sessions, the highly durable football goal will solidify its position at the epicentre of your set up for years to come. Manufactured from 60mm reinforced aluminium, the sturdy posts can weather a storm of powerful strikes as well as inclement weather. 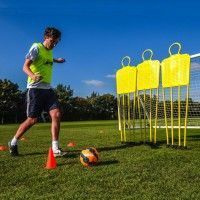 Fully weatherproof and resistant to rust or corrosion, the convenient aluminium football goal can be left set up outdoors throughout the year without compromising its pristine quality. 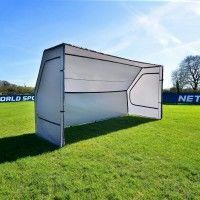 Perfect for both 9-a-side matches and senior training sessions, the freestanding football goal can be transported between playing venues without much effort. 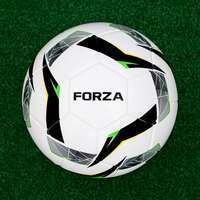 The lightweight feel of the framework belies their robust manufacturing, taking the endeavour of two people to shift the position of the aluminium football goal. 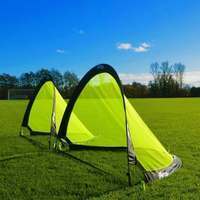 Ideal for coaches and clubs who play the beautiful game at numerous locations, the portable football goal is suitable for use on all surfaces, including indoor hard pitches and artificial surfaces such as 3G, 4G and AstroTurf. 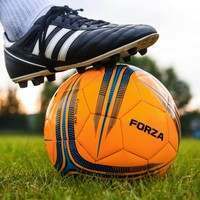 Ensuring that all necessary health and safety measures have been undertaken is important before engaging in junior football matches and training sessions. Having breezed through stringent independent safety testing to BS EN 8462 standards, the goal won’t sag or upturn during use, guaranteeing security and safety. 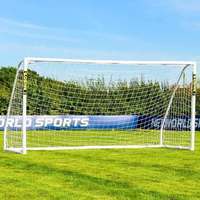 As well as premium quality 16 x 7 football goal posts, the package is completed by a 3mm HDPE braided twine goal net, which remains securely fastened to the goal thanks to the included twist and pull net clips. 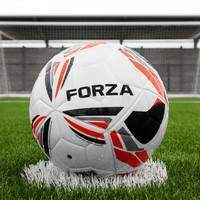 Great goals that are exactly as described, you pay more but you get real quality, very solid goal that a truly fit for purpose. 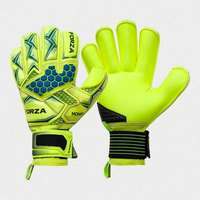 Relatively easy to put together, although the instructions can be a little misleading and are certainly not idiot proof, maybe because they cover different models. I found my self with additional bolts left that should have been used but instruction only shows using 4 in stead of 6. So had to dismantle and reassemble. Despite the instructions I would recommend this product. Will these goals support the weight of a 15-year-old boy swinging from them? Hello Ryan, thank you very much for the question. Unfortunately, this isn't something we can guarantee I'm afraid as they're not really meant to be swung on. They do conform and have been independently tested to BS EN 8462 safety standards so they can withstand a considerable amount of pressure. does the crossbar come as one piece? What is the weight of the assembled goal? Hello, thank you very much for the enquiry. The weight of this specific goal is 22kg (48lbs).